The Nikon Coolpix P7700 was launched in August 2012, it is a well featured, high-end compact camera designed for the discerning amateur and for professionals looking for a camera to have with them all the time. The zoom lens has a range of 6mm through to 42.8mm (which is equivalent to 28mm-200mm in ‘full frame’ format), it has a bright maximum aperture of f/2 at the wide end and f/4 in telephoto. The screen is fully articulated, 7.5cm (3”) across and has 921k dots. In terms of performance the camera will capture stills at a rate of up to 8 frames per second (for up to 6 frames), ISO from 80 up to a maximum of 6400. Video capture is full HD, 1080p at 30fps. None of these features is particularly extreme, there are other cameras that match or better each specification. However taken as a whole the package is comprehensive and offers the serious photographer exactly what they need in a camera of this type. In DxO Mark’s testing the Nikon Coolpix P7700 does very well. It does not beat all comers but what it does do, very convincingly, is to beat everything that might reasonably be compared to it. With an overall score of 53 the Coolpix is beaten by only 5 other cameras, all of which are significantly more expensive. Of the other 5 cameras two have a fixed focal length lenses, one has interchangeable lenses and the other two have lenses with much less zoom range. A wide zoom range does not make a camera good but if you want a camera to carry around all the time then it is very useful. The individual scores are, for Portrait: 21.1 bits of colour depth, for Landscape: 11.1 Evs of dynamic range and for Sport: 191ISO. These are really impressive scores and place the Coolpix 7700 right at the very top of the remaining cameras in the high end compact class. For Dynamic range it is actually 4th over all. Changes from Nikon’s last version, a comparison with the Nikon Coolpix P7000 and the Nikon Coolpix P7100. As you can see the Coolpix P7700 shows improvements across the board over the P7000 and the P7100: 1.7 bits of extra colour depth, a full stop of additional dynamic range and around a 1/3 stop of low light performance. 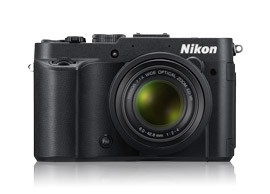 Nikon launched the Coolpix P7XXX range in August 2010, bringing out a camera with a 10.1Mpix sensor, the P7000. Not the highest by any means but able to produce good quality results. In 2011 they updated the camera, adding a tilt mechanism to the monitor and, judging by the test results also tweaking the software. However the update in 2012 is a major overhaul: with the exception of the general look of the camera it is all new. New faster lens, new sensor: a 12.2 Mpix BSI-CMOS (back side illuminated) device, a fully articulated monitor, full HD capture compared to 720p on the previous models, faster continuous stills capture: 8 fps instead of 1.2 fps. This list goes on with improvements all along, the only thing that seems to have been dropped is an optical viewfinder. For all these improvements the Coolpix P7700 is not more expensive than the launch prices of its predecessors: in this highly competitive market the P7700 is excellent quality at a reasonable price. This chart shows clearly the progress that has been achieved in the Coolpix P7XXX cameras, not a vast jump between P7000 and P7100 but a significant leap onto the P7700. Here the 1.7 bit improvement in Colour depth, showing consistently better performance at all sensitivities. Competition from the rest of the industry: Nikon Coolpix P7700 Vs Canon Powershot G15 and Fujifilm Finepix X10. In making a comparison with other cameras, it seems fairest to look at alternatives that appear to have similar specifications. Canon fills this brief with the Powershot G15 and Fujifilm with the Finepix X10. Neither of these has quite the zoom range of the Coolpix P7700 which has a range of over 7X, the Canon has a 5X zoom and the Fuji a 4X. There are numerous other candidates too, but these two seem closest. The overall DxO Mark scores for these three cameras are 46 for the G15, 50 for the X10 and 53 for the P7700. In the individual scores the Nikon wins in every measure except for low light in which it is pushed into second place by the Fuji, 191 against 245. These cameras are very similar, they are about the same size and weight, the functionality is very close too. If it were not for the different names on their casings they could be from the same stable. What makes the comparison interesting is that for all their similarity the Nikon has an indicative price nearly 20% lower than the others whilst still performing the best of the three. The red line through the centre is the Coolpix P7700. The scores per ISO setting are better than the Canon and beat the Fuji at lower ISO. Another camera that might bear looking at would be the Panasonic Lumix DMC LX7 which, like the Fuji camera, has a 4X zoom. At the time of writing this camera has not been tested by DxO Mark, but it does fit into the same general grouping and its price is still cheaper than the Coolpix. It has a sensor of 10Mpix which for photographers interested primarily in stills may be a disincentive. What it does have is higher frame rates for video and this might counterbalance the smaller sensor for those interested in motion capture. More information will be available when it has been tested by DxO Mark.